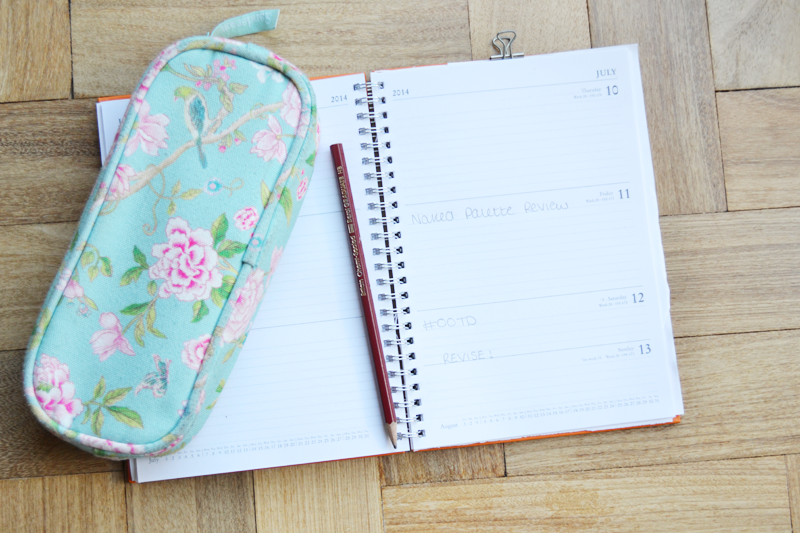 Being a blogger and a A-Level student can sometimes be hard, I’m at Sixth Form five days a week from 8:30 till 3/4 and spend a lot of my spare time doing sport, so it’s always hard to to balance my study time and my blogging time. After juggling both for over a year now, I’ve learnt many lessons..
Make lists of what you want to blog about – I have a little notepad and pen on my bedside table to jot down any ideas I have, whether it be a particular outfit/item of clothing or a review. There’s been so many times I’ve thought of something great to blog about but not noted it down and forgotten about it! Also, the satisfaction you receive when you cross everything off your list is great. I’ve always scheduled posts, especially when I’ve had exams. I know some bloggers aren’t so keen on people writing posts months ahead, but at the end of the day, my education comes first and if that means having posts go up when they’re no longer necessarily up to date, then so be it! Of course, don’t go doing Christmas posts when it’s mid-summer, but you know what I’m getting at here. I tend to make sure I have 2 or 3 drafted posts at a time so if something does pop-up, I have something that keeps my blog active. I like to know when I’m going to blog. For example, I’ll wake up on the weekends and set myself an hour or two to do a few blog posts in the morning, and again in the evening and I’ll do some studying during the day. This way I know I’ll get everything I need to do done. Similarly, sunlight isn’t around every hour so sometimes it’s a good idea to pick a certain time to take your photo’s. During the week I don’t have time to photograph my outfits, so normally I’ll pick a day when I don’t have much work to do and I’ll go through and picture all of the outfits I wore that week during the day when there’s the right light for photos. You need to know where your priorities lie. For me, blogging is simply a hobby and my education will always come first, so sometimes my blog will have to take the back seat for a while, but that’s okay. If you have a job, maybe that will take priority. Some people are lucky enough to have blogging as their job! I am very guilty of doing posts simply because I have time, and not because I want to. I sometimes have days when I really aren’t feeling it and am incapable of doing a fairly decent post. Nobody is forcing you to blog. Most readers are bloggers themselves and know what it’s like. If you’re not going to produce a good post, don’t force yourself. Readers can wait that extra day, or maybe week! What are your tips for balancing blogging? "Avon Mega Effects Mascara Review"